I am working on a HUGE review of way-too-many A5 notebooks – 28 journals, to be exact. Here’s a sneak peek of which journals and pens I’m reviewing. NOTE: Not every notebook is listed yet – I’m still working on all the details, but this is at least my current working list of notebooks I’m reviewing. Sign up at the end of this page to receive email notification when I publish the full review. I prefer black pens in my bullet journal. I rarely use colored markers (even though I have a massive collection, for some reason), instead, I use a couple different highlighters for specific headings. I didn’t test colored markets or brush pens in this review. 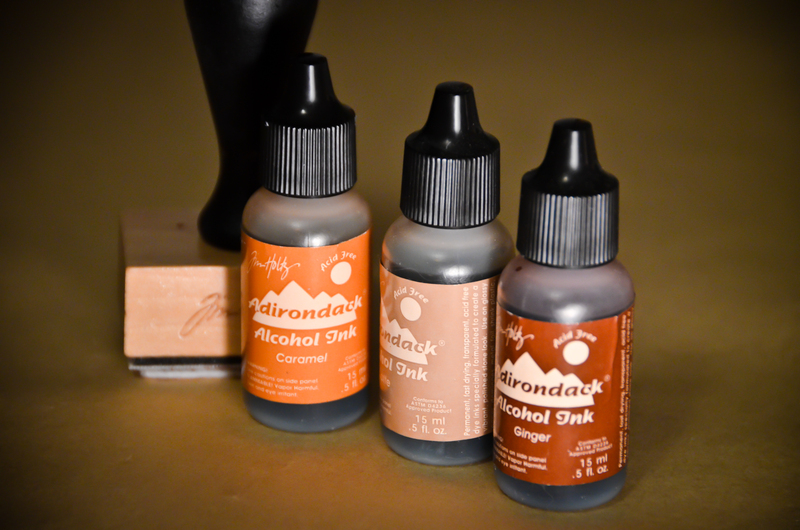 However, the pens used here represent a wide variety of pen types – marker, gel pen, fountain pen, archival ink, and liquid highlighter. If you’re really anxious to see some reviews, I’ll let you in on a secret. All the journals I’m reviewing are getting their own video spotlight on my YouTube Channel. I’ll be adding videos as I create them so I can embed them in this review article as I write. Gimme a couple weeks to wrap this up, okay? I’ve been typing my fingers off and taking about 7 million photos, so this is taking a bit longer than I ever expected. But I want you to see it when it’s done. So come back soon, or just sign up below and I’ll shoot you an email when this thing is finished. It’s going to be epic. No really… seriously epic! DISCLAIMER: This post may contain affiliate links to Amazon, however, none of these journal or pen reviews are sponsored. This is an unbiased, unpaid, unsponsored, no-BS review of these notebooks. Nobody gave me notebooks for free. Nobody paid me. Nobody promised me roses or steak dinners to write nice things about them. Everything I write is my honest personal opinion. I’ve recently begun reading “How to Think Like a Great Graphic Designer” by Debbie Millman. First, I have to say that it’s been a while since I’ve encountered Debbie Millman. Years ago I listened to as many podcasts as I could from her website Design Matters. Somehow I forgot about her amazing radio shows and now I have a LOT of catching up to do! As I’m working my way through her book about influential graphic designers of today, she has piqued my interest about each of the people she features in this book. I’ve had to stop midway through the chapters to look up images and designs mentioned in the interview. This got me thinking about my recently completed education in design school and the distinct lack of research into current design greats. We studied art history and studied individual aspects of design elements like typography or layout. But we never had the opportunity to dig deep into what makes a graphic designer outstanding in the industry. So I want to do some digging and see what I find. For those that know me, you know that I’m a research fanatic. I love to get my teeth into a topic and find out everything I can about it and figure out how that new information applies to my life, my work and my goals. I know I’m not the only graphic designer who has vowed to step away from the computer once in a while so I can have more time to play with my art supplies. There are dozens of books that challenge designers to stay fresh with creative inspiration. Recently I was sorting through all my design books (whoa! I have a lot!) and discovered a pattern in my collection. 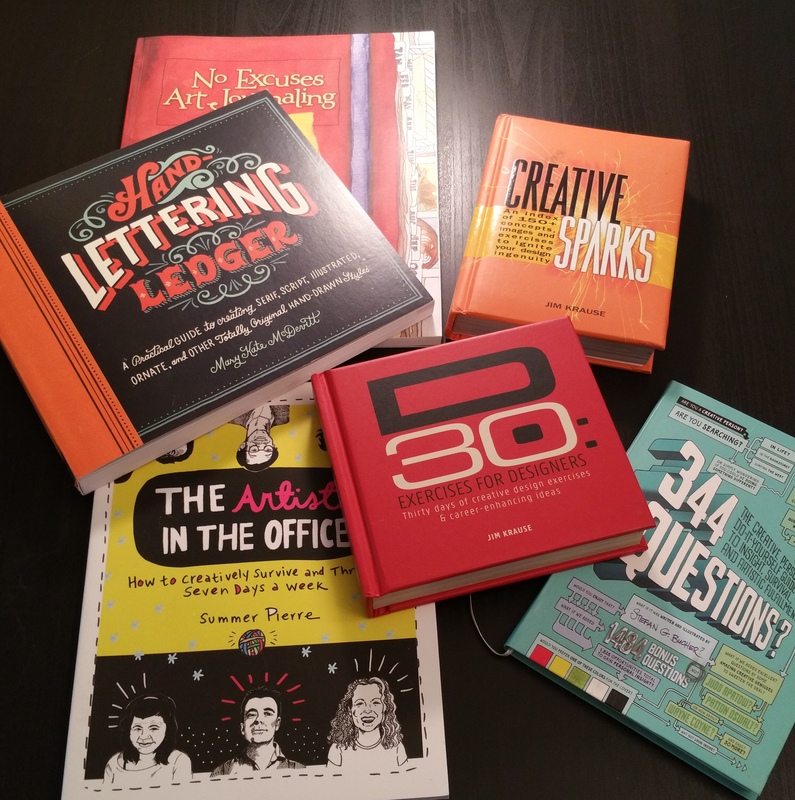 There are lots of these creativity challenge books written specifically for graphic artists. And this picture represents just some of what I own – there are several on my Kindle and about 4 or 5 more in my library at the day job. By day I am an in-house graphic designer for a local government agency. And all the rest of the minutes of my day I’m building my freelance graphic design business. So you can image that I spend a lot of time in front of a computer – too much time! Just like many of my other designer friends and colleagues, I fear burn-out. So I’m on a quest to feed my creativity! I can’t wait to get my hands dirty and play with sketchbooks, paint, markers, journaling, sticks, rocks, dirt, and anything else I can get my hands on! I started reading Jim Krause’s D30: Thirday days of creative design exercises & career-enhancing ideas book and he listed some of the supplies I’ll need. He suggests googly eyes, pasta, crayons, lunch and a friend. A friend! What a great idea…. will you join me in this fun adventure of creativity? We’re going to have a blast! I’ve long wanted to learn how to paint beautiful watercolor art. Thought about taking a class but decided to just jump right in and try it. 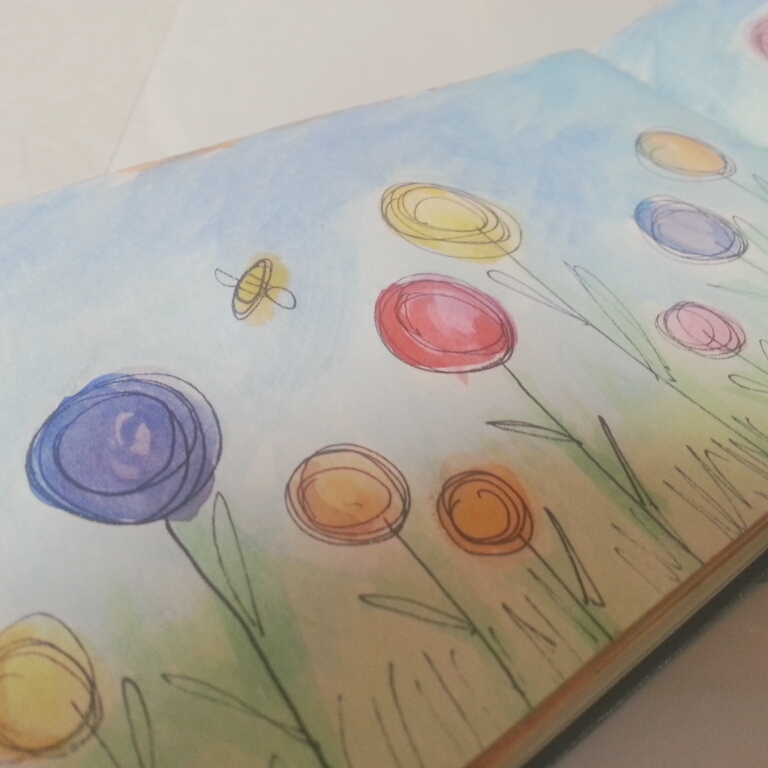 I’m using a small Moleskin journal and I love the size. Here’s what I made today using a sharpie to draw the flowers then paint over them. 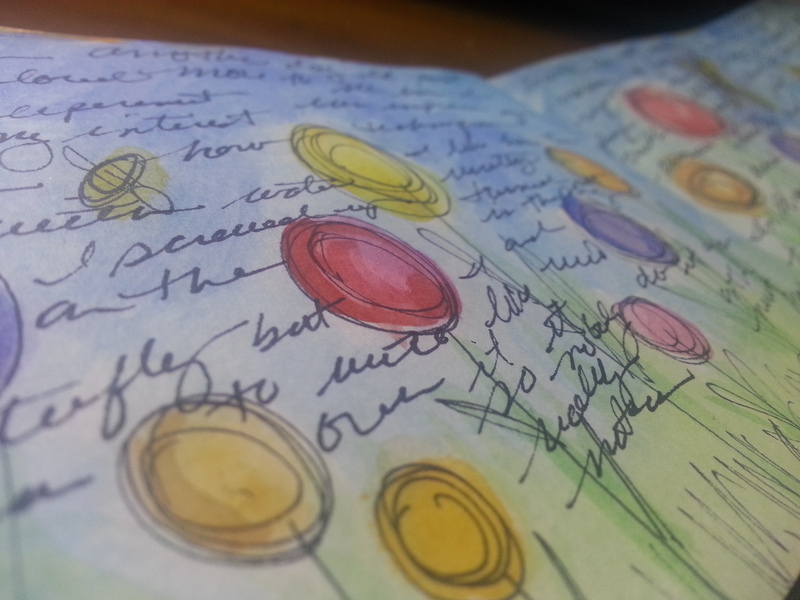 Then I just wrote some journaling over top of the dried pages. Fun! 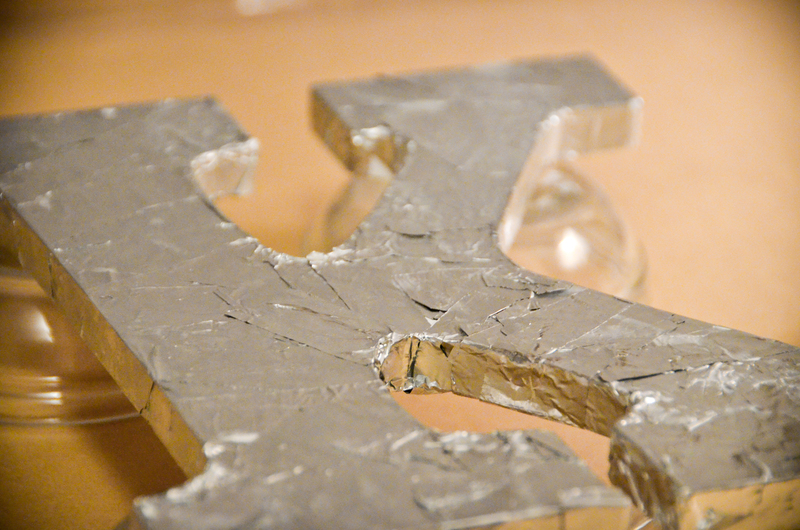 Have you ever wanted to try silver leafing, but felt intimidated by the process and expense? Here’s an alternative. 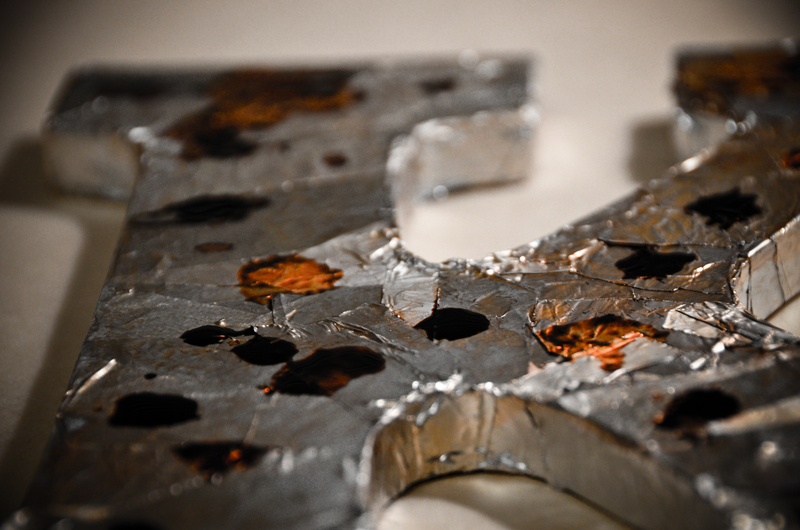 Using wallpaper paste and aluminum foil, this faux silver leaf project can be used on many different DIY projects. I decided to start small with a wooden letter. But you could use this technique on furniture, walls or just about anything you can imagine. I originally found this project on Pinterest from Red Hen Home — she covered bedside tables using the faux silver leaf awesomeness. And check out the silver leaf wall at The Ivy Cottage. Start with a wooden letter you can get from any craft store. 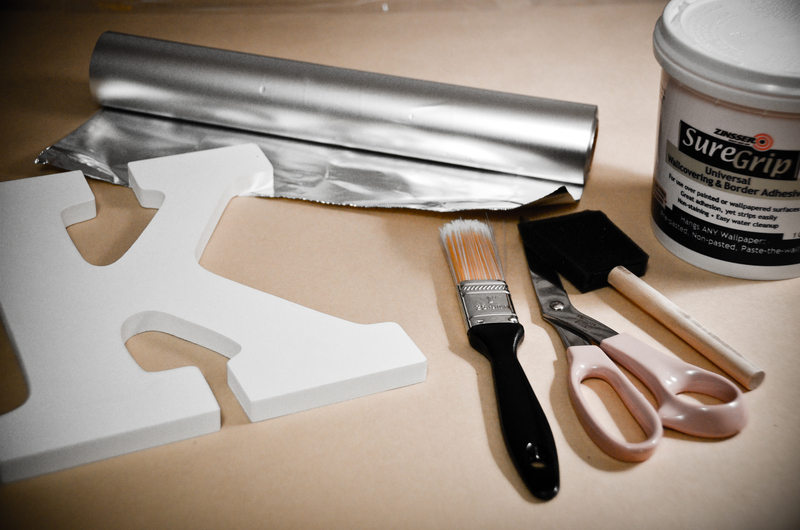 A roll of aluminum foil (the thinner and cheaper, the better), wallpaper paste, scissors, and a paint brush if you choose (I used my fingers). Next cut a bunch of aluminum foil. 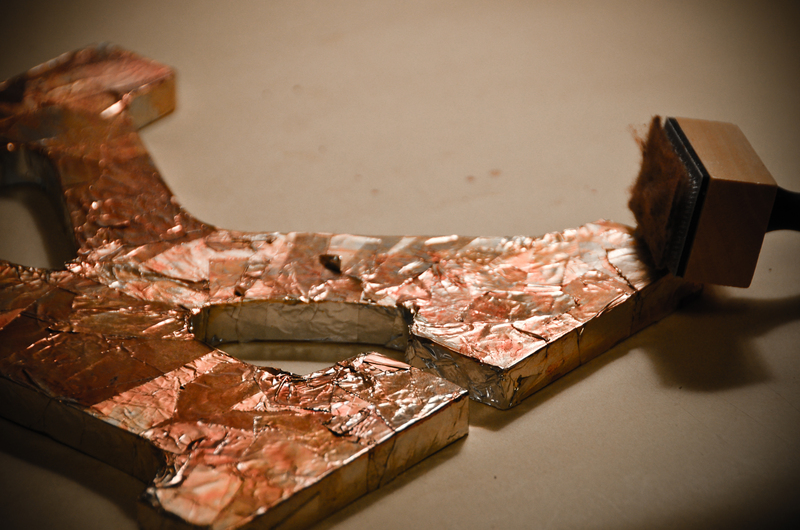 I used about 18 inches from the roll and then cut it into thin strips – I wanted the sharp, straight edge on the pieces I attached – but you can tear the foil into random pieces or cut into larger pieces. Whatever you choose is fine. I learned the hard way to cut the pieces individually because if you try to cheat and fold the large piece in half or quarters, then cut several layers at a time – you end up with a botched mess and the pieces are attached to each other and you can’t easily tear them apart. So do it the hard way. Now the fun part! 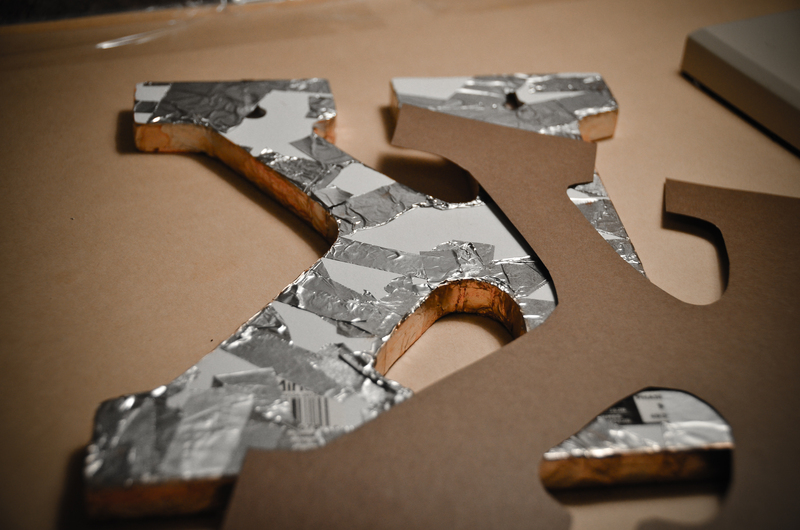 Dip your fingers into the wallpaper paste and smear a thin layer onto the wooden letter, then start applying the foil onto the letter. Just repeat this process until everything is covered. If this is your first time, you might want to choose a less complex letter than the “K” (why do I always pick the most difficult option with the most curves and angles?). When the letter is completely covered, let it dry. 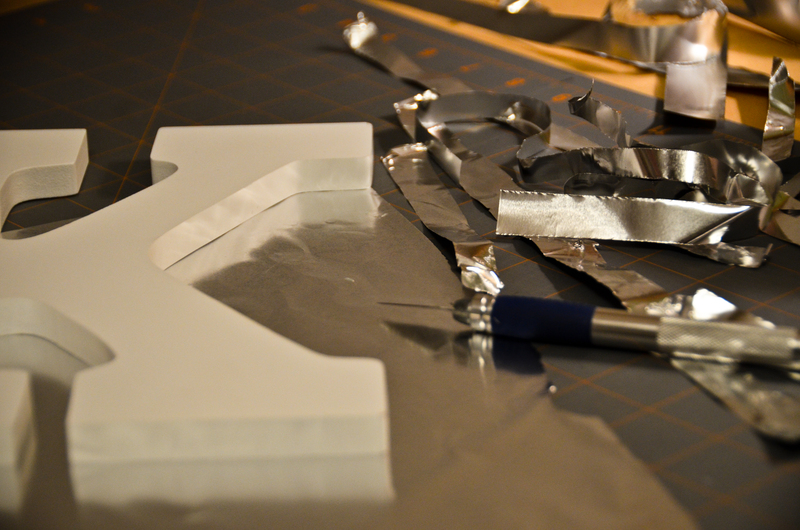 I elevated the letter using small bowls – use whatever is handy – so it doesn’t stick to your work surface overnight. Don’t worry about the spots you missed. We’ll cover that up the next day with some alcohol inks. Once the wallpaper paste is complete dry the next day, now it’s time to make it pretty with some color. I chose to use three shades of brown for a coppery look. Just drop a few drips of each color all over the letter and then blend it in with your cotton-clad dabber. I took the cotton off the dabber at the end and used it to get into all the angles and the edges (yes, my finger are now latte, caramel and ginger colored). Cut a piece of cardstock for the back to cover up the messy edges. I used my Xyron machine to make the cardstock into a sticker and just pressed it onto the back. I plan to display this on the Ikea picture rails I have in my living room. (Just ignore those frames that still need photos, pretend there’s something beautiful there!) 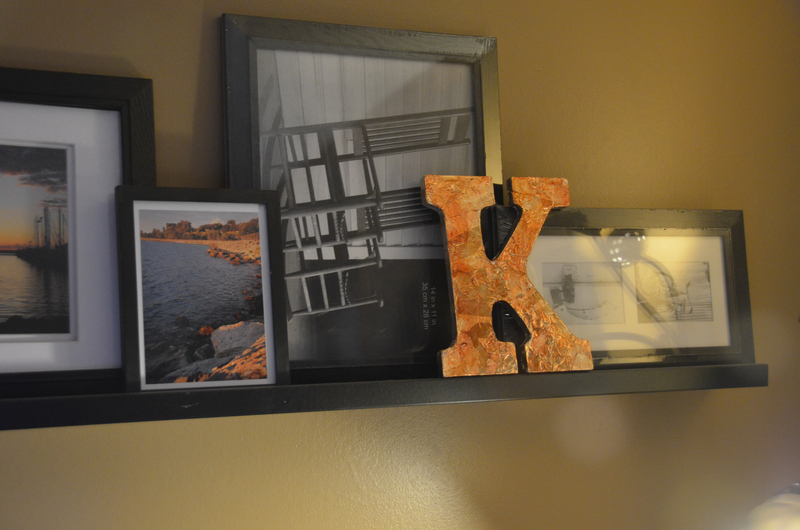 I chose the letter K for my niece Krista and figured that if I didn’t like how it turned out that I could just spray paint it and give it to her to put in her bedroom. But, unfortunately for Krista, I LOVE this project and I’m keeping it.